The Sun did not breach the Editors’ Code of Practice with a story criticising Nottingham City Council’s £40,000 spend on moving newts, the UK’s largest press regulator has ruled. The article, which was published in print with the headline “£40,000 blown on moving 40 newts” and online under “Newt worth it” on 13 April, said the council had paid experts to remove the amphibians from a pond at the site of a new enterprise zone so it could build a bridge to a science park. This was “at the same time it needs to make £27 million of cuts”, the Sun said. The title reported the council’s position that it had to move the great crested newts by law but quoted criticism from a local councillor and resident. 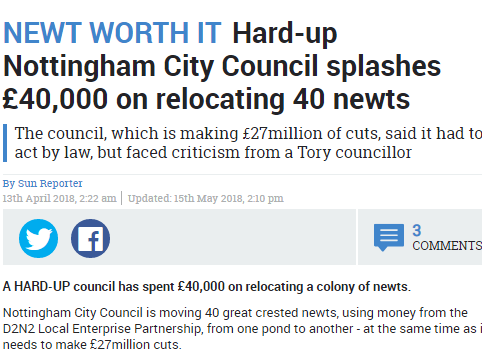 In its complaint to the Independent Press Standards Organisation, Nottingham City Council claimed the article was misleading as it linked council spending cuts with money spent on the newt relocation. The money came from the central government’s D2N2 Local Enterprise Zone funding instead of the council’s budget, the local authority said. 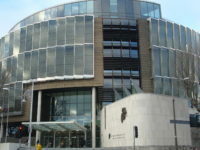 The Sun accepted that the funding did not come from the council’s general budget but argued “it was still funding which the council had spent, from state funds it could access, which could have been spent on other things in the Nottingham Enterprise Zone, had the newts not been moved or if the council negotiated a better deal”, the IPSO ruling said. 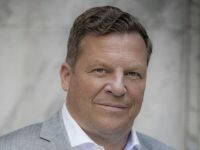 The tabloid amended its online version of the article as a gesture of goodwill to include a “prominent reference” that the funding came from the D2N2 pot, but denied any breach of the Editors’ Code. IPSO ruled there was no breach of Clause 1 (accuracy), saying: “In the view of the committee, while the article highlighted the council’s budgetary position, it stopped short of claiming that the funding came from the council’s budget; it was ambiguous. Ok 40 Newts, what strikes me is how it could have cost such an amount..perhaps the paper in question could have investigated how 40000 could be the figure necessary for such a small number of Newts..